In The Gospel according to John, the apostle’s use of Psalm 69 implies that Psalm 69:8 is about Mary’s other sons. and the reproaches of those who reproach you have fallen on me." In addition, the context of John 7:3-5 is about his brothers not believing in Him, and then in verses 6-8, it becomes even more clear that John is saying that Psalm 69:8 is about Mary’s others sons. John 7:6, “Jesus therefore said to them, “My time is not yet at hand, but your time is always opportune.” John 7:7, “The world cannot hate you; but it hates me because I testify of it, that its deeds are evil.” Because verse 3 in the same context says, “His brothers therefore said to Him, “Depart from here and go into Judea, that your disciples also may behold Your works which You are doing.” – here is a clear distinction between Jesus’ brothers and Jesus’ disciples. He contrasts between the faith and love of the disciples and the hatred and unbelief of the world. He does the same thing in John 15:25, another quote from Psalm 69. “They hated Me without a cause”. Now the context of the cross and the giving of Mary to John to care of her becomes even more important and more clear that Mary had other children. And then in John 19:27-28, where Jesus says, “Behold, your mother!”, Jesus is clearly connected her with Psalm 69, because his real brothers have disowned Him and been estranged from Him and rejected Him, and hated Him, so therefore, He commits His mother to John. In verse 28 of John 19, the Scripture says, “. . . in order that the Scripture might be fulfilled, said, “I am thirsty”. Psalm 69:21 – with Matthew 27:34, 48, Mark 15:23, 36, and Luke 23:36. In church history, some people began to make unreasonable deductions about Mary, going beyond Scripture, adding to Scripture, and contradicting Scripture. These unreasonable deductions led to the whole series of unbiblical traditions about Mary (prayers to her, IC, BA, co-mediatrix, some even calling for co-redemptrix to be defined as dogma) and led to the over-exalting of Mary, the over-emphasis on virginity (even after marriage), and celibacy as a requirement for all ministers in the RCC in church history. It is called a “higher way of holiness”. This implies that married folks cannot attain to a holy life, and it seems to exalt works over grace and faith. Obviously, Psalm 69:5 is NOT about the Messiah, because He was sinless. (John 8:46; 2 Cor. 5:21; Heb. 4:15, Heb. 7:26; I Peter 1:19-20). This can be understood the same way that 2 Samuel 7:14a is about the Messiah, but 7:14b is not about the Messiah. So, it is possible that Psalm 69:8 is about Mary's others son who are against the Messiah and don't have faith until the resurrection and afterward, but Psalm 69:5 is not about the Messiah. By the way, a great sermon on Psalm 69 and emotions, including other quotes in Romans 11 and Acts 1, in his series on some of the Psalms in "Thinking and Feeling with God" by John Piper is here. So his brothers said to him, "Leave here and go to Judea, that your disciples also may see the works you are doing. For no one works in secret if he seeks to be known openly. If you do these things, show yourself to the world." For not even his brothers believed in him. Jesus said to them, "My time has not yet come, but your time is always here. The world cannot hate you, but it hates me because I testify about it that its works are evil. You go up to the feast. I am not going up to this feast, for my time has not yet fully come." After saying this, he remained in Galilee. One of the ways skeptics attack the resurrection is they say Jesus only appeared in His resurrection to His friends, believers, disciples. They were His enemies in their unbelief; but they believed at the resurrection and afterward; especially, James (I Cor. 15:7; Galatians 1:19; Acts 15:13ff. )and Jude (writer of the epistle of Jude). So Christ appeared to some enemies, namely His brothers, and Saul, who became Paul. A powerful apologetic for the resurrection. Seems clear that John and Jesus are making this connection between the sufferings of David in Psalm 69, that his own brothers, "my mother's sons are against me"; and also this is prophesied about the Messiah and it happen that way; and so it is clearly implied and alluded to by the way John uses Psalm 69, the connection "for" in verse 9, and the contrast between the faith of the disciples and lack of faith in His brothers in John 2:12-22; then the hatred and unbelief of His brothers in John 7. Putting it all together, it makes perfect sense why Jesus committed His mother to John, and seeing the connection of John 19 with Psalm 69 and the other gospels and giving His mother to John; (Psalm 69:21 : Matt 27:48; Luke 23:36; John 19:29; Mark 15:23) makes it even stronger that he is saying Psalm 69:8 is about Jesus' brothers, the sons of Mary. So, the virgin birth of Christ is protected, by Scripture alone; Matthew 1:18-25 and Luke chapters 1-2; but the Perpetual Virginity of Mary doctrine and dogma is un-Scriptural and not truth, therefore, it should be abandoned. It is a man-made tradition. We are required to believe in Mary's perpetual virginity, meaning that she was always a virgin and had no other children, and that Jesus' birth was a miraculous one, not (far as I know without checking) in any particular hypothesis accounting for the exact nature of the relationship of these persons called Jesus' "brothers" in Scripture, according to standard Hebrew / Aramaic cultural custom. If they were cousins, the NT writers would have used the word for “cousin”. Also, there are other words for close relative, cousin, as in Luke 1:36 "your relative Elizabeth"
sungenis (English phonetics) The double gamma, "g" is pronouned "ng". Also, in Matthew 12:49-50 - the point would be lost, if he meant "cousins", because Jesus makes the point that His true spiritual brothers are disciples, believers; and His blood (half) brothers were not believers at that time. ( John 7:5 "for even His brothers were not believing in Him.") This point, Tertullian argues in Against Marcion 4:19. He is more ancient than the later "ever-Virgin" texts of other early church fathers; so this position, that Mary and Joseph had a normal marriage after Jesus was born, is the one that is deeper in history. In Matthew 12:50 - He is making this point, the true brothers are those that believe and obey and do the will of God; not His physical brothers who don't believe. The whole RC argument for the Perpetual Virginity of Mary falls flat. Also, Psalm 69:8-9 seems to point to His brothers being His mother's sons. Psalm 69 has lots of Messianic prophecy in it; though not all of it applies to Christ, obviously verse 5 does not apply to Jesus. Hebrew parallelism "brothers" = "mother's sons"
If Mary had male children other than Jesus, it would have been a HUGE insult to them for Jesus to entrust her care to the apostle John who was not a "blood" relation. So, He is ashamed to call His real brothers, "brothers" (at the cross) and does not honor them with the care of Mary; but gives her to a faithful believer, John. Eric Svendsen's book, Who is My Mother? Soundly and thoroughly refutes the RC apologetic for the Perpetual Virginity of Mary. Rhology had a post on the PVM also some time ago. He provides some good links to further refutations of the PVM. Luther was no shrinking violet. It seems to me that he also had as high an opinion of himself as anybody in history and in fact, He could easily be the poster boy for arrogance. Needless to say, humility was not his strong suit. The quotes and source look very similar, so I don't think it's a stretch to say one probably comes from the other. In both quotes, the emphasis is placed on Luther's claim about himself. In the former, the quote proves Luther's view of himself indicates arrogance and a lack of humility. The later presents a psychological Luther so out of touch with reality he represents himself with absurd statements. In each instance, the furthest thing considered from either of these statements is any sort of context. These days "Grisar vol. 5" is easy enough to locate, and for those of you not used to this game, it isn't a primary source of Luther material. "Verantwortung der auffgelegten Auffrur, 1533" though is a different story. The title is elsewhere referred to as, Verantwortung der auffgelegten Auffrur von Hertzog Georgen, and it's located in WA 38, the German edition of Luther's Works. To my knowledge, this document it not available in English. The full English title would be, Vindication Against Duke Georg's (Charge of) Rebellion, Including a Letter of Consolation to the Innocent Christians Driven By Him from Leipzig. One of the best overviews of the background of this work was put together by Mark U. Edwards in Luther's Last Battles. The background is quite fascinating. Duke George had set up a situation in which Protestants were to be watched how they took communion during Easter (they were to receive in one kind). Those not conforming to the method as directed by the Duke were to sell their possessions and be banished from Ducal Saxony. Luther was alerted to this situation, and he advised (via a letter) those convinced to receive both elements do so. The letter made it back to Duke George. Luther's letter was described as "Unchristian and rebellious" and an attempt to provoke the people to be rebellious against authority. While [Luther] bore no grudge against anyone, he wrote, he had to innocently bear the title of rebel, a title that Christ himself had to bear. 'For he himself was also crucified as a rebel and hanged between two murderers, and his rebellious title was King of the Jews, that is that he wished to oppose the emperor, his authority, to make his subjects disobedient and disloyal, and to make himself king, etc.' In fact, since the time of the apostles, no one had more magnificently upheld secular authority than had he. The real rebels were the Catholics who condemned the lay estate and tried to turn rulers into monks. "If any grace can be deserved from a cursed and sinful world, and if I Dr. Martin had taught or done no other good thing than thus to have brought to light and decked out the secular government and power, for that one deed at least they should both thank me and favor me. For I have such glory and honor, through the Grace of God, concerning this matter (whether it pleases or pains the Devil with all his fish-scales) that from the time of the Apostles no Doctor or writer, no theologian or legal scholar, has so notably and clearly strengthened, instructed, and consoled the consciences of the secular estates as I have done - through the extraordinary Grace of God, this I know for certain. For neither Augustine nor Ambrose (who nevertheless were excellent in this business) were my equals in this, etc." What I find so ironic in the criticisms above is that Luther was often accused of being a lackey of the princes and rulers. In fact Rome's defenders themselves often blame Luther's involvement with the rulers during the peasants war. In this instance, Luther admits his deep involvement with secular rulers, but he's still chastised by Roman Catholics. I will say though Grisar is definitely onto something when he refers to this quote and says, "His actual words reveal their hyperbolical character, or rather untruth, by their very extravagance." True indeed, Luther was prone to strong hyperbole, and Rome's defenders continually miss this. If one reads through any of Luther's strong polemical treatises, this type of language abounds: anger, sarcasm, hyperbole, all weaved together. What I do find interesting is that those Roman Catholics who take such sentiment from Luther with the utmost seriousness haven't seriously countered his claim. Cochlaeus parrots the same sentiment above by saying Luther wasn't humble. Others may think it proves Luther instability or insanity. But in terms of evaluating Luther interaction with secular rulers up to 1533, forget about hyperbole, and answer his claim. As Edwards states, "Luther, on the basis of his theology of the two kingdoms, could with complete consistency argue that no one had advocated obedience to secular authority more forcefully than had he" (p.66). On the other hand, Edwards notes some problems with consistency in practical application with Luther's view. These are much different considerations that aren't even touched by the Roman Catholic citations I began this post with. No, they're concerned about psychology rather than history and facts. It appears, for Rome's defenders to be deep into reformation history is to go deep into psychoanalysis, not history. I am engaging in a formal debate with an Eastern Orthodox blogger on the topic of Sola Scriptura. It's my first debate, and it's not as ambitious as far as word limits go as, say, TurretinFan's debates. But I'm having a good time already. OK, someone navigate this one for me. Carrie's quiz is hard enough, but this one is real mind bender. Layman or cardinal... layman or a guy who went on to be pope...hmm... this IS a tough one... OK, I give up. Who would Luther rather celebrate the Eucharist with? I have been MIA awhile and that will (unfortunately) continue for awhile longer. But I thought I would check in quickly with a quick quiz. I was cleaning out some piles of papers and came across a pamphlet from Our Sunday Visitor entitled "Top Ten Reasons to Come Back to the Catholic Church". I'll give you reasons #2-10, let's see if you can guess what #1 is. No cheating and only Protestants can answer. 10. Because they want meaning in life. 9. Because childhood memories surface. 8. Because they made mistakes. 7. Because they need to forgive others. 6. Because they want to be healed. 5. Because the Catholic Church has the fullness of truth and grace. 4. Because they want their children to have a faith foundation. 3. Because they want to be part of a faith community. 2. Because they want to help other people. The person who guesses the right answer gets...the satisfaction of being right. Here's an ironic tidbit from Martin Luther, Hitler's Spiritual Ancestor, by Peter F. Wiener. In this section Wiener is chastising Luther in regard to the Peasants War. Recall, the tumult and slaughter of the peasants increased in 1525. In fact, the section of Wiener's book the following excerpt comes from is entitled, "1525 and all that." No, Luther would not retract a single word of his pamphlet or apologise for it as the offspring of momentary passion. Instead, he began to elaborate his new political theory, a theory which was so readily accepted in Germany. “Scripture speaking figuratively”, wrote Luther in 1526, “calls rulers drovers, taskmasters, and scourgers. Like the drivers of donkeys, who have to belabour the donkeys incessantly with rods and whips, or they will not obey, so must the ruler do with the people; they must drive, beat, throttle, hang, burn, behead and torture, so as to make themselves feared and to keep the people in check" (E15, 276). Note the words "new political theory" "wrote Luther in 1526" and then in the next paragraph, "The princes obeyed." Wiener appears to be saying in 1525 the princes obeyed Luther's advise given a year later in 1526 from a sermon Luther gave on the use of the law. The "brutal revenge" sounds suspiciously like the events of 1525. While it's true the Peasants war extended into 1526, it doesn't seem like Wiener means 1526. As to the prince quote "I hope we are now going to play with heads as the boys play with marbles" you can find it here, used in the context of 1525, but without documentation (in a Roman Catholic source). I wouldn't be at all surprised to find out this Roman Catholic source was where Wiener got the quote. 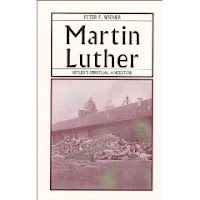 If Wiener meant only Luther's 1525 treatise, "Against The Robbing And Murdering Mobs of Peasants," Luther's harsh advise came out after the wars began. That is, the princes were already in progress of using their force to kill the peasants to suppress their revolt. The book was delayed in printing. For more on this, see this link. A friend sent me this quote, he said I asked him about it two years ago. I don't remember asking, but I'm grateful he sent it. The astute reader may have noticed that no one on the highly-trained (and highly-paid) Beggars All blogteam regards the gospel that the Roman church preaches to be a Gospel that saves. We also find numerous Roman dogmas to be heterodox, blasphemous, and/or heretical. And we spend most of our blogging time defending these views in argumentation with various opponents of various stripes. I ask you now to grant that we firmly believe this and firmly believe it to be defensible, just for the sake of argument. Why do we spend our time blogging about these things? It is but one poor and humble outreach to practitioners of Romanism, whom we believe in general to be lost, apart from Christ, without the Gospel of grace. We hope to persuade and convince some or many to come to Jesus. It is an act of love and compassion to the lost. We do it because we love them and want them to see the truth. There are some who label us as "anti-Catholic". I would like to submit that we are, rather, pro-Catholic. We are merely anti-Roman CatholicISM. We believe that one of the best things that could happen to a Romanist would be to come to Jesus and leave the Roman church, because we don't believe the Roman church has the Gospel. And we want them to! We want them to come to know Jesus! Because of this, the label "anti-Catholic" is completely wrongheaded. If we were truly anti-Catholic, we would do our best to assuage the troubled conscience of the Romanist: Yes, I know you are questioning why it is that you can go to Mass faithfully for 30 years and yet never be perfected and die in mortal sin and go to Hell, but that's OK. Just trust the Pope. He's a great guy! He's respectful, he kisses Qur'ans and stuff. He kisses babies. He loves you, and really, isn't love all you need? Yes, I know you wonder about all the emphasis placed on Mary, but it works! She's the Queen of Heaven! Jesus would never refuse His mother. So don't worry about it. The Church has been around 2000 years - you really think it could be wrong? Now, all of that would be with forked tongue because we would know in our hearts that we would be encouraging our Romanist friends to go further into darkness. But that would be what we would want, because we're really anti-Catholics! We'd want them to go to Hell. We'd want them to spend their entire lives and eternity apart from Him, because we're anti! It's like something my pastor likes to say, in discussing the 2nd great commandment to love one's neighbor as one loves oneself. Today's culture and liberal-leaning members of Christian and formerly-Christian traditions like to remind us that "if you don't love yourself, you can't love your neighbor, so you need to have good self-esteem", and so "love yourself" becomes a de facto 3rd great commandment. My pastor points out that love of oneself is assumed in Jesus' command (not to mention the various passages that tell us a sign of evil last times will be "lovers of self"). The person deceived by the culture's arguments thinks, "I don't have a good self-image and don't like myself enough. I need to be healthy and think good things about myself and make sure that I'm secure in how good I am before I can even think about loving others". Pastor goes on to say, "If they really hated themselves, they would want to have low self-esteem! They would want to destroy their self-image. They would never go to therapy to get better, not if they really hate themselves!" It's counterintuitive to today's culture, but it makes perfect sense if you think about it a little. But of course, that's not our goal or our desire. We are pro-Catholic because we are anti-Roman CatholicISM. Our Romanist friends and readers will surely disagree with our anti-Roman Church stance, but I'd ask them to consider the wrongheadedness of calling us anti-Catholics. At most, we are unintententional anti-Catholics (if you're coming at it from the Roman side of things), but the hyperbolic language thrown around by some goes well beyond that, and fails to take into account the real state of our hearts. Here we see the interior of the Hagia Sophia, in Istanbul. (see the other articles below for details on the history.) The Muslim Ottoman Turks conquered Constantinople in 1453 and changed the church into a Mosque. It was later changed to a Museum. Notice the icon of Mother Mary and baby Jesus; and the Arabic calligraphy sign "Allah" to the right and "Muhammad" to the left. The icons were plastered over for centuries; only in recent years were the icons restored. When they heard Christians calling Mary, "the Mother of the God"; they thought the Trinity was "The Father, the Son, and the Mother". The church had neglected and long since left its first love (see Revelation 2:4-5; Jude 1:3 & 1:21; 1 Peter 3:15); so God allowed Islam to judge and conquer. The church neglected their Biblical love relationship with Jesus; drifted from sound doctrine; added man-made traditions; fought with themselves over territories and were plagued with political intrigue; neglected evangelism and missions; the Chalcedonian Orthodox and Byzantine methods and soldiers were too harsh against Monophysites and Nestorians; the wars of Persia and Rome left a vacuum for Islam to fill; then the aggressive Jihad wars of Islam came and filled that void; and the heretical and nominal Christians in the east and the desert influenced Muhammad and gave him a wrong impression of what Christianity is. The importance of Evangelism, missions, bible translation, contextualization, acculturation, church planting. Two Centuries after the Islamic conquest of the land of Christianity, the first project to translate the gospels into Arabic was started! We will continue with this in a future post. How and why did Churches become Mosques in the Middle East? 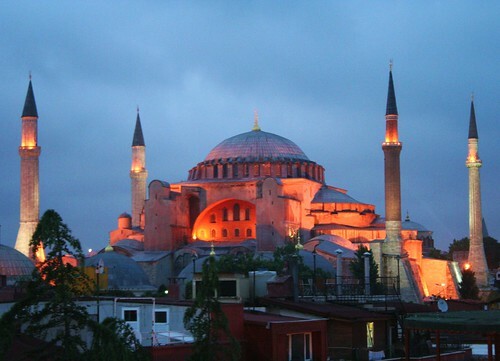 The Hagia Sophia ( The Church of Holy Wisdom, from the Greek words, “Hagia” for Holy, and “Sophia” for wisdom) was built under Emperor Justinian’s reign (consecrated in 563 AD), after other smaller churches were on the same site since 326 AD, under Constantine. This is still the most incredible dome structure in the world that has never been able to be reduplicated at that size without much more support underneath. The famous early church father, John Chrysostom (bishop of Constantinople 398-404 AD) ministered from the old church building that was here before the current structure was built. According to tour guides, Chrysostom’s stone pulpit is in the courtyard of the Hagia Sophia. When the Muslim Ottoman Turks conquered Constantinople in 1453 and renamed the city Istanbul, the church was converted into a Mosque and the minarets were added. All of the pictures of Jesus and Mary and other Biblical stories on the walls were plastered over for many years, because in Islam, to paint a picture of a prophet is considered idolatry. In 1847-1849, the building was restored and since 1935 it has been a Museum. Leaving their first love (Rev. 2:4; see also Matthew 22:36-40); which resulted in lack of evangelistic outreach; and the combination of false doctrine and sin in the churches (most of the other churches in Rev. chapters 2-3) and other political and social factors, and becoming lukewarm and self-sufficient, (Rev. 3:15-19), is the root of all of the other human and historical factors that eventually led to the demise of the once on fire and somewhat healthy churches of the New Testament. But just because the apostles Paul, John, and Peter; and leaders like Titus and Timothy got the churches started, does not guarantee that they would last. Each generation must be wholly devoted to God. “. . . teaching them to obey everything I have commanded you . . .” (Matthew 28:18-20) But ultimately God in His pleasure and wisdom and for His own glory has allowed all of these things to happen so that He could get greater glory later, when the gospel would go to the Muslims and other unreached peoples. God is beginning to do this mighty work of sovereignty in providentially opening up the Muslim World in this day. And God is using the fanatical expressions of Islam to make Muslims disillusioned with Islam all over the world. In the last 30 years, it seems more Muslims are turning away from Islam, to Jesus Christ, than in previous generations! This is especially true among Iranians, who are not Arabs, but Persian. They have t heir own language and rich culture history, including Kings mentioned in the Bible; Cyrus, Dariush, Khasharyasha ( Xerxes) and Ardishir (Artaxerxes). The Khomeini regime (beginning in 1979) exposed the true nature of doctrinal, consistent, political Islam to many peaceful and normal Muslims. The cruel dictatorships of Qaddafi of Libya, Hafez Al Assad of Syria, Saddam Hussein of Iraq, the Taliban of Afghanistan, and the trickery and deceitfulness of Yasser Arafat and suicide bombers, the violence and Al Qaida, Hamas, and other Jihadist Muslim movements are also creating a turmoil in many other normal everyday and secular Muslims. God is working in more Muslims' hearts today, than ever before in history for them to seek the truth all over the world, including the Arab World. More than ever before, peaceful Muslims are realizing that their religion itself and its doctrines in the Qur'an, Hadith, and Sharia jurisprudence contribute to the violence and nature of a lot of Islamic terrorism and oppression in today's world. The first and foremost reason for Islam conquering the Middle East is that God Himself ordained (decided to allow it), permitted it, in His wisdom and right to do such; for His own glory. God could have stopped it, just like He could have stopped the 9-11-01 terrorists. But just like with Job in chapters 1-2 of the wisdom book of Job, God pulled His powerful protecting hand back and let Satan attack Job for a purpose. In the same way, God pulled his Omnipotent hand back and permitted the terrorists to do what their evil nature enslaved them to do. “And the Lord saw that the wickedness of man was very great on the earth and that every imagination of the thoughts of man’s heart was only evil continuously”. (Genesis 6:5) “The Lord looked down on the earth and saw it was full of violence” (Genesis 6:11-12) The Hebrew is very emphatic and descriptive in these verses. This describes the depravity and the potential for evil lurking in all of our hearts. Only God’s grace and sovereignty holds back more violence and corruption from becoming even worse. Humans act according to their nature. God is sovereign and only acts according to Holy nature, being completely separated from sin. God is Holy and Pure and completely separated from evil. “God is light, and in Him is no darkness at all”. (I John 1:5) God cannot lie. (Titus 1:2, Hebrews 6:18) But God is also completely Sovereign and in control. The evil imaginations of the hearts of humans are so bad, that when God takes His protection off, He lets us see the potential of our own wicked hearts. As John Piper wrote, “How God governs all events in the universe without sinning, and without removing responsibility from man, and with compassionate outcomes is mysterious indeed! But that is what the Bible teaches. God “works all things after the counsel of His will” (Ephesians 1:11) . . . All of us are sinners. We deserve to perish. Every breath we take is an undeserved gift. We have one great hope: that Jesus Christ died to obtain pardon and righteousness for us (Ephesians 1:7; 2 Corinthians 5:21), and that God will employ His all-conquering, sovereign grace to preserve us for our inheritance (Jeremiah 32:40). We surrender this hope if we sacrifice this sovereignty.”1 God could have restrained the evil as He kept Abimelech, the king of Gerar from sinning against Sarah and Abraham in Genesis 20:6. God gets more glory by showing evil for what it is and then destroying it later. That is the basic story line of the Bible. God in His Sovereignty is not only bringing more Muslims than ever before to the west; but He is also sending out more laborers to the Muslim world today than in all previous history; and more Muslims have come to Christ in the last 30 years than in all previous mission history!! Let us make Matthew 9:37-38 a part of our prayers in our churches. When we pray for the Sovereign Lord to send out laborers into His harvest, we must surrender and we willing to be those laborers. God’s sovereignty in the past is no excuse for disobedience in the present! Don’t be afraid to witness to Muslims. Learn and get equipped on the issues and how to preach the gospel to Muslims. 1 John Piper, “Why I do not say, ‘God Did Not Cause the Calamity, But He Can Use it for Good.”, September 19, 2001. 2 Tom Wells, A Vision for Missions. Banner of Truth, 1985, p. 12-21. Luther Said God is Stupid? Pilgrimsarbour said: The characterization of Reformed believers as saying that Jesus is a deceiver is disingenuous at best. Ben M Said: But curiously, many of these same "Reformed believers" honor Luther, who said (among other things):"Gott ist dumm" "God is stupid." Martin Luther and the Jews: a refutation to his book, "The Jews and their lies", Edgar Mills, Europäischer, 1968, p. 22. Page images: Spin this anyway you please, it still ain't NEVER gonna be a right thing to say! I've had a bit of interaction with Ben M., Google Books historical extraordinaire. One thing you won't find in Ben's "research" above is anything even resembling a context. In fact, what you'll find is the typical Catholic propaganda "research" methods. You'll find an obscure Luther quote being taken from a secondary source, without a context ever being checked. Then Luther is chastised for saying something awful. "God, on the other hand, seemed to [Luther] “a master armed with a stick”. “God did mischievously blind me”; “God often acts like a madman”; “God paralyses the old and blinds the young and thus remains master”; I look upon God no better than a scoundrel”; “God is stupid” (“Table Talk”, No. 963, W1, 48)"
Of course, Ben didn't tell you outright that the quote comes from this book (his "page images" do). In fact, Ben is using a book, quoting a book, quoting Luther. And, if it really is a Tabletalk statement, it's actually someone else writing down what Luther said. Luther.... never wrote it. Ever play the phone game Ben? Nor did Ben probably do any research into how flawed Wiener's work was. In fact, the book was so poorly done, Gordon Rupp wrote an entire response to it. "My publisher and advisers," [Wiener] says, "were anxious that the book should be published in such a form and at a price that the greatest possible circulation could be guaranteed"(p. 7). In fact, this disinterested haste is made the excuse for withholding references to his innumerable quotations. A hundred or so have their references marked, but the principle on which they are given or withheld passes the wit of man to discriminate, since the harmless description of Luther's work in 1516 has full reference, while no citation at all is offered for the monstrous and absurd statement that "he did not refrain from saying and teaching 'I am Christ'" (p. 28). But then, he assures us, anybody who cares to write to him may have the references in full. And anybody with any sense knows that not one reader in a thousand will go to any such pains, but that the great majority will be vastly impressed by the references which are splashed about the pages, and by the apparent fairness of such disclaimers. Mr. Wiener manages the pattern well. He is, in fact, disarming in his modesty. "I am neither a scholar, nor a politician, neither a theologian, nor a professional author. I am an ordinary schoolmaster" (p. 5). [Gordon Rupp, Hitler's Cause or Curse, In Reply to Peter F. Wiener, p. 10]. What really demonstrates propaganda at work is Ben's conclusion: "Spin this anyway you please, it still ain't NEVER gonna be a right thing to say!" Tell you what Ben, you've stated you consider yourself an amateur historian. Why not do a little history? First locate Tableltalk 963 for us, show us the text, and then go a bit further and let us know what value a Tabletalk reference actually has, who recorded this particular one, and if that person was generally reliable. It has nothing to do with "spin", it has everything to do with honesty. You want me to take Catholic work on Luther seriously? Do some serious work, minus your propaganda. You want me to believe to be deep in history is to be Roman Catholic? Well, you better live up to it by going deep into history. "Could not one use the same kind of reasoning as to why Islam emerged and flourished for why cults have become so popular in the U.S. or for that matter, why there are so many different Protestant denominations? Your argument is: The Orthodox were a poor witness of the gospel by their actions and false teachings. Therefore, this led the way for Islam to emerge, becoming a driving force in the regions of the EO churches. Now, apply it to the Protestant Reformation. The reason there are so many disputes/disagreements within Protestantism is because of the Reformation, when conscience and Sola Scriptura were put before the authority of the Church." The short answer is that God in His sovereignty has allowed all the problems in history; both the rise of Islam and the Protestant Reformation and the dis-unity in Protestantism. But much of the dis-unity within Protestantism is a lack of applying Sola Scriptura, not Sola Scriptura itself. Local church authority with qualified elders and proper application of church discipline is certainly part of the need of the modern church today. The later flourishing of many different Protestant groups is more related to the breakup of the Medieval Synthesis and the breakup of the marriage between church and state and the freedoms of the modern world. The more unbiblical expressions of Protestantism put subjective experience and “conscience” before Sola Scriptura. But ultimately, just as God allowed Islam to over run areas that were Christian, God, in His sovereignty has seen fit to allow all the disunity and false doctrines and violations of Sola Scriptura. (see I Corinthians 11:19) I will flesh this out more in future posts. Also, if you back up and realize the disunity in Protestantism is not the fault of Sola Scriptura per say; but the false claims of Sola Scriptura with subjective experience and bad exegesis of Scripture. Update: Unfortunately, Peter Kreeft has re-written his article, and for what I remember, Scott Hahn really criticized his statement here, and he then re-wrote this, which was in early editions of one of his books. Here's a spunky blog I've been reading recently: By Whose Authority? I've seen some good posts, and recommend a visit. I've left a few comments in the Cyril of Jerusalem entry. Here's a fun little thread from Catholic Answers: Are there scripture passages the Church has defined? I've been interacting with a guy over on the CARM boards about Luther and authority. The recent discussion begins around page 36. Trust me, you don't want to trudge through pages 1-34. The only reason I decided to interact with the person who started this discussion, was that I was able to corral him in to posting 100 words at a time. Otherwise, he'd write a small book in each post. My interactions with the topic begin around post 704. As for the presence of Nicene and Chalcedonian Christianity in Arabia in the 6th and early 7th century, it is my understanding that Arabia was a haven for non-Orthodox sects—am I correct on this? I don't think there was much Chalcedonian Christianity in Arabia at all, but there was Trinitarian Christianity from the Monophysites and Nestorians (they both agreed with the Nicean and Constantinople councils and the doctrine of the Trinity) around the borders of Arabia. There was maybe some in extreme North Arabia where Saudi Arabia and Jordan are today; Muhammad and others came into contact with that in Palestine and Syria along the caravan routes. The lack of Biblical evangelism and missions set up a vacuum for more false doctrines, heresies, and eventually a new religion. Najran in the south, and Yemen had mixtures of Monophysite and later, some Nestorian churches were established. Najran Christianity was completely wiped out by Islam later and Yemen also eventually. My point is that Muhammad could not distinguish between the Monophysites, Nestorians, Chalcedonians, and Apocryphal Gnostic sects, desert monks, ascetics, and the Collyridians (if they got that idea from them); -- they could not distinguish between them because of the Marian practices, images, bowing before icons, prayers to Mary, and calling her "the Mother of the God". It was a bad witness and lack of evangelical missions on the Orthodox part; combined with the heretics who were exiled to the frontiers. Cults and heresies grew up and new religions are started from a lack of outreach and witness. If the Muslim Hadiths are truly credible about Warqa Bin Naufal; a “hanif”, ‘a seeker of the true religion of Abraham”; then it is hard to know what kind of a “Christian” he was, for he encouraged Muhammad that he was a prophet of God for his people. Warqa was the cousin of Khadija, the first wife of Mohammad. When the revelation came to Muhammad at the cave of Hira, He was shaken with fear, came to his wife and told her of what had happened. She took him to her cousin Warqa bin Naufal who was a reputed to be someone who knew the previous Scriptures and the Hebrew language, and had embraced Christianity. After hearing from Mohammad what has happened on the mountain of Hira, he said that was the Angel Gabriel, who had always brought revelation to the Messengers of God before him. Warqa Bin Naufal died shortly after this. I want to thank James Swan for inviting me to post on Beggars All. I have been involved in Muslim evangelism for 26 years; and teaching former Muslims (MBBs = Muslim Background Believers in Jesus Christ) in the Bible and sound doctrine and discipleship in church planting and discipleship contexts. Muslims have lots of questions about the canon of Scripture, issues that relate to church history, the doctrine of the Trinity, and salvation by grace alone and justification by faith alone. (But it does not stay alone; true faith results in good works, fruit, change, growth, confession and hatred of sin, deeper levels of repentance). My interest in those apologetic issues over the years has also led me to study church history more deeply, especially because it is impossible to answer Muslims questions about the canon of Scripture issue and the doctrine of the Trinity without knowing something of church history. That is what led me to blogs that deal with church history, Roman Catholicism, and Eastern Orthodoxy from a Reformed / Biblical Perspective. I also have visited a few Roman Catholic blogs in order to learn and grow and ask questions from them. Therefore, I will be commenting on issues of theology, church history, missions, outreach to Muslims; things that bring these issues together. It is my sincere belief that Muhammad and the Arabs got the wrong impression of Christianity and Christ from a combination of many different beliefs and communities that were on the borders of Arabia and all over the Middle East, North Africa, and the Persian Empire of that time period. As Islam spread out, it encountered more of the different Christian, Jewish, and Zoroastrian faiths. These communities include the heretical and nominal churches on the borders of Arabia, Yemen and Abyssinia, the eastern Orthodox/Chalcedonian Churches in Syria/Palestine; the Monophysite Coptic churches in Egypt, the Monophysite Jacobite-Syrian churches in Syria and later in Armenia; the Jewish communities in Northern Arabia, particularly in Medina; and the Nestorians in Mesopotamia (now called Iraq) and Iran. (Both Iran and Iraq were part of the Persian Empire of those days. The Muslims also probably encountered Apocryphal heretical sects that used the Apocryphal gospels. Several indications in the Qur'an point to Muhammad getting a lot of his information from Apocryphal gospels. More on that later. The Collyridians were a sect in Northern Arabia, mentioned by Epiphanius, around 374-377 AD, who worshipped Mary and offered cakes to her. (Epiphanius of Salamis, (lived from around 310-403 AD) (Panarion, or Against the Heresies, 79:4) The title of the work is Panarion, meaning Medicine-chest, but the Latin translations of the 16th century had the title Adversus Haereses, meaning Against the heresies. It is possible, though not likely, because of how small they were and that there is not much evidence that they survived into the 6th and 7th centuries; that Muhammad or other Arabs came into contact with this heretical sect and it helped form their opinions of what Christianity was. But no doubt, the images, icons, and statues of Mary, and seeing the eastern Christians bow down and pray before pictures and icons of Mary contributed to their mis-understanding of Christianity and the Biblical doctrine of the Trinity. In 26 years of evangelism and discipleship with Muslims, most Muslims still think that the Trinity is God the Father, the Son Jesus, and Mary, "the Mother of the God" (See Qur'an Surah 5:116; also 5:72-73). They do blaspheme who say: "God is Christ the son of Mary." But said Christ: "O Children of Israel! worship God, my Lord and your Lord." Whoever joins other gods with God, - God will forbid him the garden, and the Fire will be his abode. There will for the wrong-doers be no one to help. They do blaspheme who say: God is one of three in a Trinity: for there is no god except One God. If they desist not from their word (of blasphemy), verily a grievous penalty will befall the blasphemers among them (Qur'an, Surah 5:72-73, Yusef Ali translation). We will attempt to go more into these issues in my next post. Do you know if Calvin really wanted Servetus put to death? I know he wrote he wouldn't stop it, if he were put to death (paraphrased). I know the two often corresponded, until Calvin lost patience. But a Reformed guy told me, last summer, that when Servetus wrote he wanted to come to Geneva or Vienna, I forget which, Calvin tried to discourage him? And that when he did get arrested, and sentenced to burn alive at the stake, Calvin tried to get the sentence mitigated to the quicker and more humane decapitation? A few months back Dr. White provided a very helpful overview on this issue on the Dividing Line. I extracted the 20 minute section on Calvin and Servetus. ...if they advertise in America, NCR, Commonweal, First Things, etc., then it’s the same old liberal, progressive approach to theology that has basically sucked the faith out of the Catholic Church today. It is the same liberal, modernistic theology (if you can call it theology) that is taught at Catholic University of America or Notre Dame University. Although I’m sure there are some good aspects to these lectures, knowing what I know of the lecturers, their alma maters (Georgetown University, The Jesuit School of Theology, Union Theological Seminary, Catholic Theological Union, Boston College, Franciscan School of Theology, St. Patrick’s Seminary) and their allegiance to the liberal institutions for which they write and work (The Catholic Biblical Association, Catholic Theological Society, The New Jerome Biblical Commentary, The Collegeville Bible Commentary) I could not recommend any of them to you. To a man (and woman) these teachers believe the Bible is riddled with historical and “religious” errors. Many of them wrote sections of the New Jerome Biblical Commentary edited by Fr. Raymond Brown and Fr. Joseph Fitzmyer, two of the most liberal Catholics in academia. For them, the Bible is mainly the work of man, and only a few parts were actually inspired by the Holy Spirit. They do not believe most of the historical narratives in Scripture ever took place (e.g., Adam and Eve, Noah) and they believe much of the Gospels were made up by either the evangelists or the generations that came after them. They question the resurrection of Christ, the immaculate conception of Mary, the infallibility of the pope, the existence of the devil or hell, and many other cardinal doctrines of the historic Catholic faith. In brief, these lectures are indicative of the sad state of affairs in Catholic academia and scholarship today. Today’s Catholic scholars took over where the Protestant liberals left off at the turn of the 20th century, and they are much worse than the Protestant liberals ever were. They simply do not have the traditional faith of our Fathers and medievals any longer. Can't Find a Good Protestant Church, and Think Converting to an "Old" Church is the Answer? In a comment box on another post, a person considering joining the orthodox church stopped by. She appears to have gone to a number of different Protestant churches. I realized my answer was getting long, so I figured it best to just make it in to a blog post. She asked a number of questions. This post addresses the first. She stated, "I am increasingly convinced that the Lord is drawing me to the Orthodox faith and away from Protestant Evangelicalism." I have only a cursory knowledge of Orthodoxy. The only external means by which I could evaluate this statement is by using the only standard of absolute certainty available to mankind: the Sacred Scriptures. In her response, after outlining the differences in many of the churches she attended, she asked a crucial question: "How does one KNOW that they KNOW they are adhering to Sacred Scripture?" My immediate response: "by embracing Orthodoxy or Romanism" does not answer this question. Sometimes Orthodoxy and Romanism will highlight differences among Protestant churches and attempt to present the alleged only other option. I call this the “old = true” argument. They argue, the oldest visible church, that entity that traces herself back to the very roots of Christianity, only that entity will be without innovations, and has an intact consistent theology, not subject to change. I'm not sure if she's run across this argument yet, but if the “old = true” argument has been presented to her as a solution to troubles with Protestantism, it is a bogus argument. "Old" doesn't necessarily mean "true". Orthodoxy and Romanism both claim the pedigree of true and old. Which is the correct one? They don't completely agree in doctrine or practice. How do you "know" which one is the right one? Akin: "This isn't exegetical rocket science"
I also have a strong feeling many of the same epistemological arguments used by Rome's defenders could be similarly used by Orthodoxy. Some years back I highlighted some crucial responses to Roman Catholics using the "How do you know" argument. Roman Catholics think their epistemological problems have somehow vanished by their choice to enter and believe the Roman Catholic Church. My philosophy teachers would have a field day with such a person. It would be very easy for a non-Christian skeptic to tear their arguments on "certainty" to shreds. Source: Eric Svendsen, Upon This Slippery Rock: Countering Roman Claims to Authority [New York: Calvary Press, 2002] 65-66. Again, I'm not as conversant in Orthodoxy as I am in current Roman Catholic apologetic tactics, but I have a feeling some of these question hit the target. “In describing the situation at that time Hegesippus goes on to say that until then the Church has remained a virgin, pure and uncorrupted since those who were trying to corrupt the wholesome standard of the saving message, if such there were, lurked somewhere under cover of darkness. But when the sacred band of the apostles had in various way reached the end of their life, and the generation of those privileged to listen with their own ears to the divine wisdom had passed on, then godless error began to take shape, though the deceit of false teachers, who now that none of the apostles was left threw off the mask and attempted to counter the preaching of the truth by preaching the knowledge falsely so called.” [Source: Eusebius, The History of the Christian Church From Christ To Constantine (Minneapolis: Augsburg Publishing House, 1975), 143 (online link to this section)]. For such are false apostles, deceitful workers, transforming themselves into apostles of Christ. ﻿And no wonder! For Satan himself transforms himself into an angel of light. ﻿Therefore it is no great thing if his ministers also transform themselves into ministers of righteousness, whose end will be according to their works. “For I know this, that after my departure savage wolves will come in among you, not sparing the flock. ﻿“Also from among yourselves men will rise up, speaking perverse things, to draw away the disciples after themselves. ﻿“Therefore watch, and remember that for three years I did not cease to warn everyone night and day with tears." But even if we, or an angel from heaven, preach any other gospel to you than what we have preached to you, let him be accursed. ﻿As we have said before, so now I say again, if anyone preaches any other gospel to you than what you have received, let him be accursed. Keep in mind also the churches Mentioned in Revelation. Here we find controversy, problems, and some major differences. does that therefore invalidate them as churches? Where was their unity? The Church of Pergamos: there were those who had absorbed the doctrine of Balaam, and the doctrine of the Nicolaitans (Rev. 2:14, 15). The Church of Thyatira: Allowed the prophetess Jezebel 'to teach and seduce My servants to commit sexual immorality and eat things sacrificed to idols' (Rev. 2:20). “The history of the Church subsequent to the apostolic age demonstrates that succession is no guarantee against heresy. Bishops from all the major sees of Christendom, including that of Rome and those of innumerable lesser sees, have, at one time or another, been infected with heresy. The Church fathers cautioned believers repeatedly that bishops were to be followed only if their teachings conformed to Scripture and rejected if they did not. No Church father believed the Church as a whole to be infallible. The opinion was that individual bishops, as well as bishops in Council, could err. It is our contention that the early Church fathers, with unanimous voice, point us back to holy Scripture as the only infallible norm. The Church is not infallible. 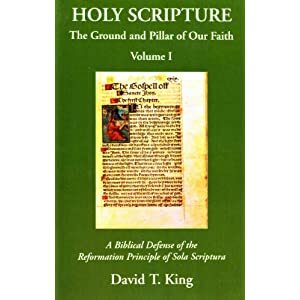 The Scriptures alone, being God—breathed and therefore inspired, are the only infallible norm for the Church.” [Source: David T. King, Holy Scripture: The Ground And Pillar of Our Faith, Volume 1 (WA: Christian Resources Inc., 2001), 138-139]. I don't buy the argument that states since people interpret the Bible differently, it's central message, big points, and Gospel message can't be known or understood. My response to the question ultimately boils down to, do a little work, or a little more work. Study your Bible and pray. Trust that God will give you a teachable spirit. Hold God to his promise that his word is a lamp. But don't think for a moment that by making a fallible decision to join either Roman Catholicism or Orthodoxy somehow alleviates epistemological problems. It creates more. Growing in the knowledge of the truth is lifelong. Don't give up growing spiritually by surrendering your intellect to ____________ (fill in the blank with whatever you want). Find a church that adores sola fide, and looks to the sole infallible authority of Scripture. Both of these can be read and discussed with a family after dinner.